The MJ Hrycko team with staff from Bovis Homes Southern Counties region. 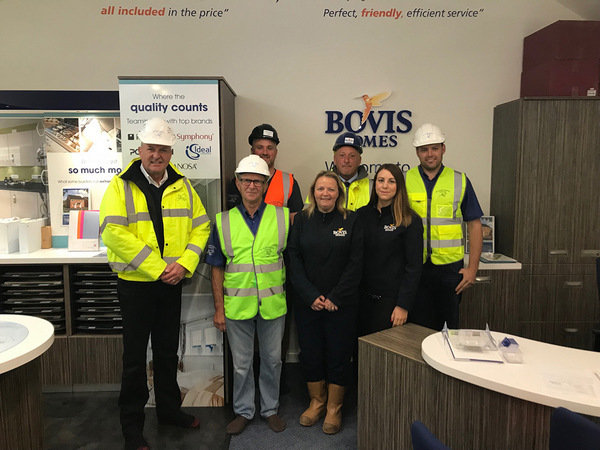 MJHrycko Carpentry Contractors partners with the regional customer care team on homes at their Shinfield Meadows, Emmbrook Place and Hatchwood Mill locations and has worked closely with the department to instil Bovis Homes' own values among its teams working on these sites. This includes carrying out a series of seminars and audits with all its dedicated 'customer care' carpenters, as well as putting in place a system of 'sorry we missed you' cards for missed appointments, and implementing different colour shirts and hi-vis jackets to help customers differentiate between customer care carpenters and site carpenters. This is all with the aim of creating better understanding and relationships with customers. Emily Arnold, Quality Control Manager said: “Hrycko have a very proactive approach on site and they share our commitment to quality and service. There's no doubt their efforts have resulted in an improved level of customer satisfaction.